Our difficult journey began when my son, Harley, needed open heart surgery when he was two years old. Sadly, his dad then died when he was three. Like many families, we’re no strangers to cancer, my dad has been diagnosed and my father in law died of cancer last year. Only two weeks later, we found out that Lia, my little girl, had liver cancer. For months prior to Lia’s diagnosis, I had been saying that there was something wrong, but doctors kept saying, “…it was normal, it’s viral, she’ll get over it.” When they did finally check her over, one doctor said he could feel more liver than he’d like, but that that can be normal in some children. It was only when we were in the Out of Hours surgery that a doctor said that Lia’s liver was enlarged and that we needed to get her to hospital immediately. After her blood tests, we were sent straight to the cancer ward, although I didn’t realise it was the cancer ward until I got there. Nobody told me my daughter had cancer. That was a shock for me. 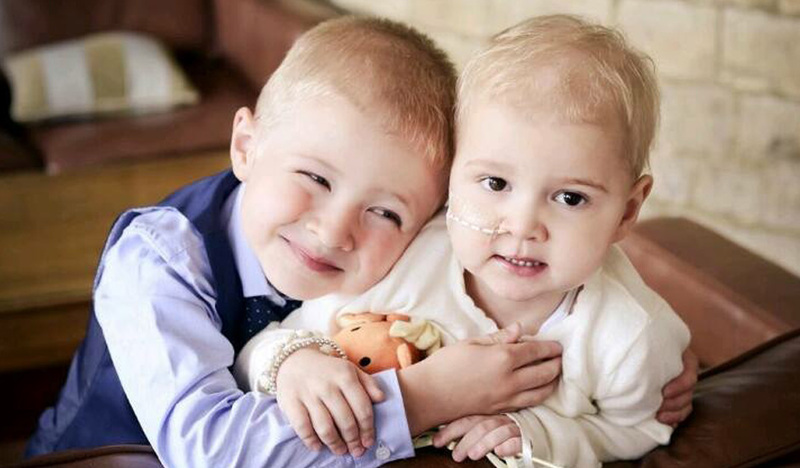 After Lia’s scans, her temperature spiked and she was sent to Bristol hospital. They told me what they believed it was, but we’d only know for sure after blood results came through. Once they confirmed it was liver cancer, we spent six months in Bristol because Lia caught chicken pox whilst having chemo, which didn’t help. She had a full liver transplant in June 2016 and she’s now had her one year review, thankfully, that went really well! While I was in the hospital with Lia, my mum moved into my house so they could look after Harley. It was around this time that I heard about Rainbow Trust and Sarah, our Family Support Worker, started to support us. Having someone who said, let me help you, was so great as I probably would never have asked. I was very dubious when Sarah first started because I didn’t want someone doing the things I felt I should be doing as a mum. You feel like you’re letting your children down by having someone in to help, but actually, it’s been great and the extra support takes the pressure off me. Sarah is someone I can talk to - she helps me out with the children and keeps them entertained. She’s also helped me to tidy up, I have back problems which makes it difficult for me to do some things. She has been a great, in all ways to be honest! As the children are so close in age, they fight and argue a lot and her being able to take them out for the day, gives me a break. Just having that one day of peace and quiet, really means a lot to me - I really need it. She also helps me emotionally, having someone you can talk to is important. The amount of people who disappeared and walked away since, first when my husband died, then when Lia was diagnosed, was unbelievable. I guess they don’t know what to say or how to deal with the situation. The kids absolutely love Sarah – Lia adores her. When we go to the park, Sarah will push Lia on the swing for hours if Lia gets her way. Sarah does drawing and colouring with them, having another adult in their life that they can rely on and talk to is crucial.